Two-time Hero Indian Super League champions ATK have not had a great time in the last couple of seasons when they failed to even make the top-four spots. However, one youngster has been the silver lining for the Kolkata side. Former Mumbai FC winger Hitesh Sharma has amazed one and all with his mazy runs up the left flank, as he cut inside, either to unleash a fierce shot on goal, or to set up the two mercurial strikes – Manuel Lanzarote, or Balwant Singh. The diminutive boy from Jalandhar had started off his footballing journey at the Chandigarh Football Academy, where he trained for four years, before moving to the famous Tata Football Academy in Jamshedpur. Having traversed the pitches of the North and the East, Hitesh finally got his first professional contract at Mumbai FC at the age of 19 in the 2015-16 season. The 2016-17 season turned out to be the last one for Mumbai FC, as Khalid Jamil left for Aizawl FC, where he went on to win the Hero I-League title. “Mumbai FC was my first professional club, and I will always be grateful to them. But it is sad to have seen them get relegated first, and then shut shop,” said Hitesh. “They had one of the most passionate fan bases in the country. You may have heard of the Mohun Bagan, or East Bengal, or Kerala Blasters fans, but Mumbai FC fans were one of a kind,” he continued. “They travelled with us even to away games, they even gave us the full support till our last match, even though they knew that we were already getting relegated. Hitesh, who was soon picked up by ATK Head Coach Teddy Sheringham in the ISL Drafts the next season. For the youngster, it was a rather a star struck occasion, when he started taking to the training pitch alongside the likes of Robbie Keane. It was a bit of a topsy-turvy season though, for Hitesh, as he played under three different Head Coaches at ATK last season – Teddy Sheringham, Ashley Westwood, and Robbie Keane. While so many changes kept happening around him, Hitesh kept on learning from a senior teammate, who he looks up to a lot. Hitesh has not played in the Senior National team yet, but the youngster certainly has taken steps towards a future that may see him donning the jersey someday soon. The youngster has already been picked in the India U-23 sides though on two occasions – AFC U-23 Championship Qualifiers in Qatar, and SAFF Championships in Bangladesh last year, where former Head Coach decided to take an U-23 team. 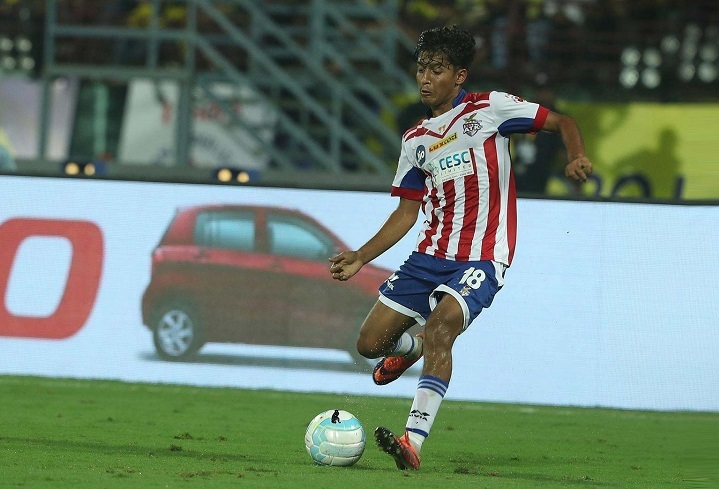 Hitesh believes that being one of the promising youngsters at ATK, he is always under pressure to perform, which is something that keeps him going.